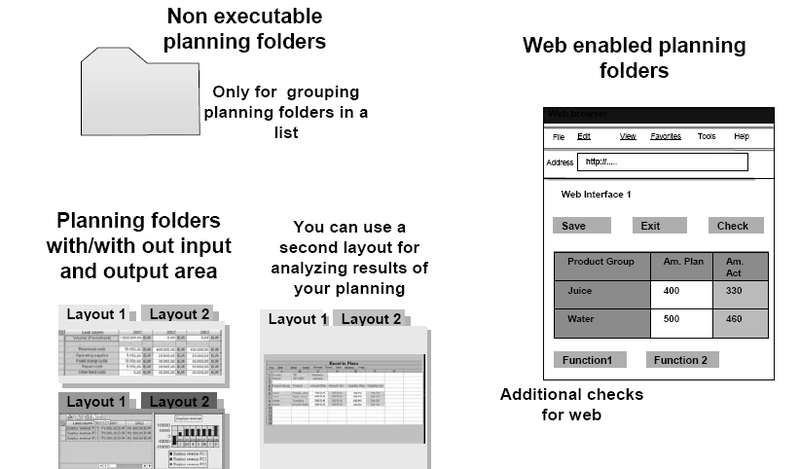 Planning folders are used as the end user front end in the BPS. Planning folders are not only used to deliver the end user fixed layout/package combinations and thus facilitating the manual planning but can be used to build up entire planning applications. Planning folders are used to group together objects you have already created in the planning framework and thus make the navigation more easy for the end users.The layouts used in the planning folder can be used for data input as well as for analyzing the results of the data input. For doing this analysis layouts that are only ready for output are used. The non executable folders are used to group the executable planning folders in a list (just as a file folder). It makes it easier for the end user to find the right planning folder if there are many of them. 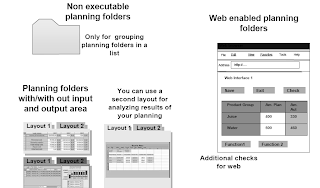 When using a planning folder in the web (web enabled planning folder) the header combination must be unique as from the planning folder a Web Interface is generated and the Web Interfaces do not support multiple header combinations. 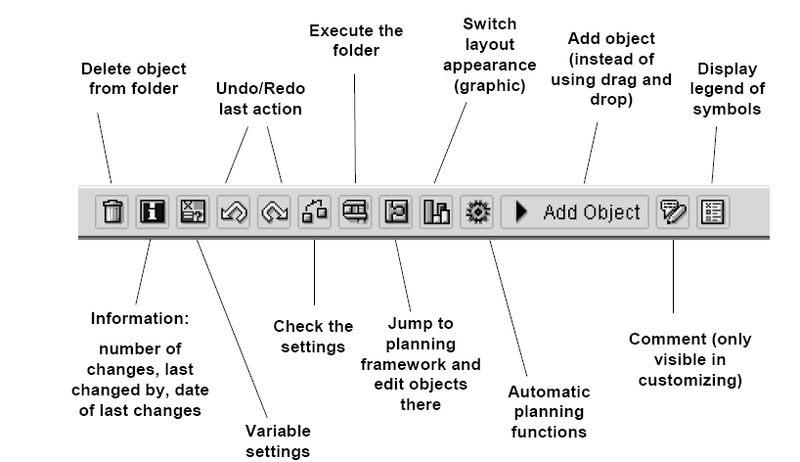 When choosing this option the system checks the header combinations when you create the planning folder. You can also generate a web interface from a non web enabled planning folder but in this case it is not guarantied that the header combination is unique and the web interface can be used. If you want to simulate the navigation through the header combinations then you can use variables for the characteristics in the header. In a planning folder you can have one input layout. you can decide whether you want to have a second layout underneath the input layout as an output layout. These planning folders are called "folders with separate Input/Output area". In planning folders that use one input layout only (and no output layout) you can use layouts with Excel or with SAP ALV as input grid. The settings from the planning framework will be used. When using planning folders with input and output layout you can only use SAP ALV because of technical restrictions. If you use a layout that is defined using Excel in the framework then the system will switch this setting for the current folder. If you need more than one input layout in a planning folder then you can switch between then by using push buttons (just like with tab strips). 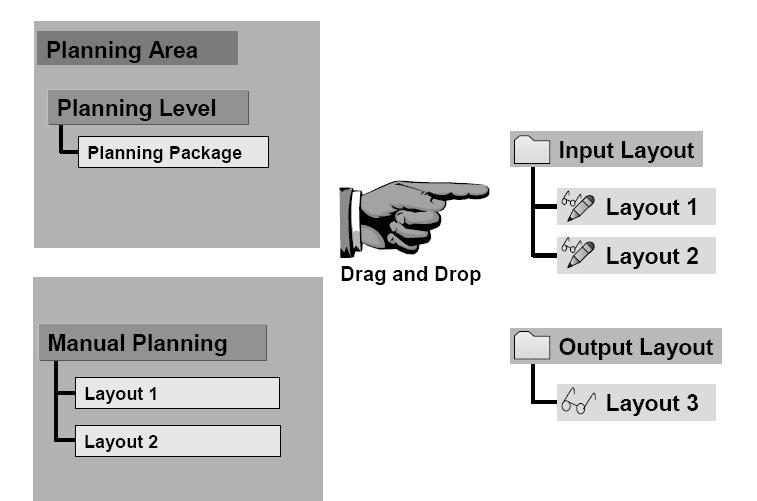 The layouts used in one planning folder (input layouts as well as output layouts) can be contained in any planning level or planning area – thus planning folder can be used to easily bring together information from different areas or levels.Example for planning folders with input and output area: you want enter data at product level but want to see the results at product group level at once. 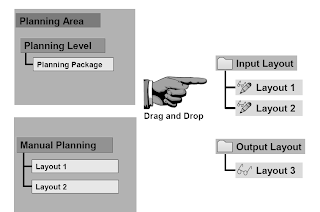 Thus you use an input layout from a planning level containing product only and display the results in an output layout from a planning level containing product group. When entering the customizing of the planning folders on the left side of the screen you will see the well-known double tree from the planning framework containing all customizing objects created in there.If you have set a planning profile in the framework you will only see the objects that are in your profile. specifying the description on the popup that will show up after drag and drop. If you drop several layout/package combinations to the same area the system will create buttons so you can switch between the layouts (as with tab strips). Jump to planning framework: you can directly jump from the customizing for the planning folder to the framework and edit the objects there. For example you can switch a layout from Excel to SAP ALV. After saving and pressing "Exit" in the framework you jump back to the customizing of the planning folders and can used the changed object. Switch layout appearance: if you want to see your data as a graphic instead of a layout you can set the type of graphic here. Note that you can only output layouts as graphic. If you want to see the values of an input layout as graphic as well include the layout as well as output layout and switch the type to graphical display. We will explain the use of variables and planning functions in planning folders in the chapters for variables and planning functions. When using the BPS with a planning folder you get a starting screen containing all planning folders grouped by the (non executable) folders.The symbols tell you whether a folder is a non executable one, a planning folder with one layout or a planning folder with input/output area.You can set a planning folder as standard folder in this screen. This folder is always pre-selected (user-dependent) and can be started directly be calling the transaction UPSX.You can display the detailed information and the description of the planning folders. When double clicking you open the chosen folder. By using authorizations you can limit which planning folder an end user can use (and see in the list). 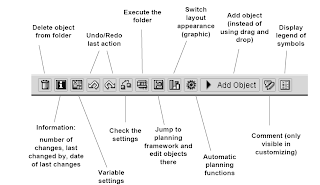 When executing a planning folder you have the same options as in the framework (except for the header combinations).If you are using a planning folder that allows multiple header combinations then you have an additional push button for extending/collapsing the header.Note that in planning folders also the buffer is used. The data is only saved if you press the save button.If you leave the planning folder all locks are released. If you move from one layout to another within the same folder the locks are not released!